Chip brushes have natural bristles, with wood handles set in epoxy. For use with resins, glues, acetone, and other solvents. Use chip brushes to clean parts, apply touch-up paint, paint trim, and many other boat, workshop, and household uses. are these brushes made in america? There are 24 2-inch brushes in a box. Up to 1.5&quot; you get 36, 2&quot; gets you 24, and anything above 2&quot; is 12 per box. I'm looking for a small metal handle (round tubular) chip brush. Ideal for small epoxy projects.Any ideas where I might find them? I use these brushes for epoxy jobs all the time. I carry boxes of them on my sailboat. I also use them for other jobs like applying a gel rust remover.I use them because they are inexpensive so are used just once and thrown away.They do shed some bristles but this isn't an issue for these applications.When using them to apply epoxy I also trim the bristles with a pair scissors to make them stiffer. Check with the west system products, they make them for use with their epoxy. I needed to get epoxy primer and then bilge paint in limber holes, so I purchased the 1/2" chip brush. Where I had enough room they worked perfectly, giving me confidence that even the tops of the holes were coated. Where there was obstruction, as with a floor beam too close I cut the handle off the brush and screwed it to the head at 90 degrees. That let me get into even the smallest areas. For small jobs where you'd rather discard the brush, instead of cleaning it, you cannot beat locating a good economical chip brush. Chip brushes require that loose bristles be pulled away or they will end up on the surface with the material being applied. Gently and methodically pull out the loose bristles, until there seems to be no more. Apply your paint or varnish. If one or two remaining loose bristle get in the finished surface, remove them and then brush over that area again. A box of chip brushes is a wonderful thing. If you are taking care of your boat, there are numerous small vanish and paint jobs to be done. Varnish require several coats and then scratch coats periodically. These chip brushes are good for holding the solvent and varnish for sanded wood (a 50-50 initial mixture). For additional coats, place the brush inside a sealable sandwich bag placed out of the heat and sun. The brush usually stays pliable for additional coats, before discarding at the end of the day. It is possible to put on three coats in a give day, before walking away to allow time for the applications to cure. These are the best bet for laying up smaller areas or for gluing. I prefer them over foam type applicators because the deposit in a smoother more natural way than the foam (IMHO). NOT for Varnish and Finnish coats where higher bristle count and quality affect the result. I have used on "quick" projects where appearance and cleanup didn't warrant getting out the "good stuff". I have purchased this item several times. Can be left in a container of Alcohol-based paint [ Bin by Zinsser for example ] for long periods of time. Once the brush has dried paint up around the top bristles, the bristles last for a long time in the alcohol. I have some that I have used for spot priming that are years old and I move them from can to can. Thes chip brushes are excellent quality (for chip brushes) at a better than excellent price. At less than 75Â¢ each, they can't be beat. Great for when you want to get a job done quickly and don't want to spend time cleaning expensive brushes. These brushes are ideal for epoxy or polyester resin application. They are inexpensive enough to be disposable and stable enough to use for coating pieces. They are also suitable for laying down a base coat of paint or varnish, though be on the lookout for individual bristles which may pull out. I would not recommend these brushes for finish coat. 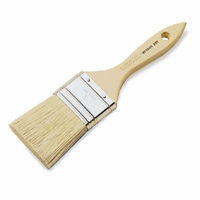 I use the brushes repeatedly for applying alcohol based bin to wood and plaster/drywall surfaces to block stains. I leave the brushes in a can with some paint in the bottom, enough to keep the ends of the brush wet. Occasionally I add some denatured alcohol to keep the level in the can high enough to keep the ends of the brush wet. Because the bristles are natural they do not deteriorate for a long time when used in this fashion. I have at least two of these cans going at all times. Some of these brushes have lasted for at least 4 years being used this way. I buy them in bulk as I also use them for working with West Epoxy, in which case they are thrown away after use. They work very well for this purpose. I know of no other product that works so well with West products. This is a sow's ear, not a silk purse. It is a most satisfactory, INEXPENSIVE brush. Five stars for doing what it is supposed to do quite well.